Leap from a flaming zeppelin with the stars of the Wild West Show in a desperate escape from an imperial Japanese enclave. Wash up upon the island of Doctor Moreau, in mortal danger from his unnatural experiments (and ignorant that Dracula approaches by sea). 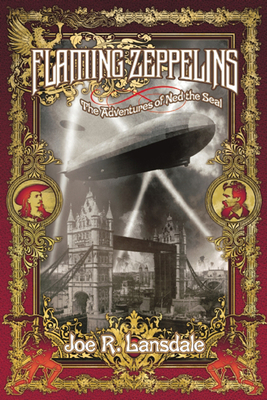 Unite with Jules Verne, Passpartout, and Mark Twain on a desperate voyage to the burning streets of London, which are infested with killer squid from outer space courtesy of H. G. Wells's time machine. It's a raucous steam-powered locomotive of shoot-'em-up Westerns, dime novels, comic books, and pulp fiction, as only Lansdale, the high-priest of Texan weirdness, could tell. Joe R. Lansdale is the author of more than thirty novels, including the Edgar Award-winning Hap and Leonard mystery series (Mucho Mojo, Two Bear Mambo) and the New York Times Notable Book The Bottoms. More than two hundred of his stories have appeared in such outlets as Tales From the Crypt and Pulphouse, and his work has been adapted for The Twilight Zone and Masters of Horror. Lansdale has written several graphic novels, including Batman and Fantastic Four. He is a tenth-degree black belt and the founder of the Shen Chuan martial art.